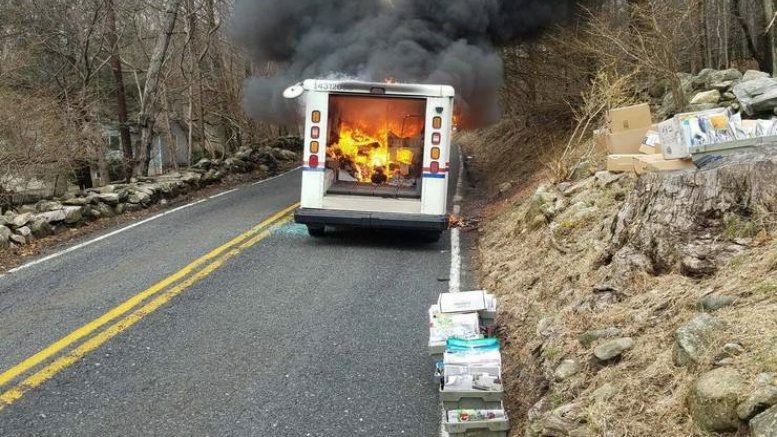 April 9, 2019 — The driver of the Somers Post Office mail truck said it was his loyalty to the community and the United States Postal Service that pushed him to try to save whatever he could as his truck went up in flames on Monday, April 8. Commendable but stupid…no amount of mail is worth risking your life for. I thought the same thing until the standup safety talk on LLV fires changed my mind. Another LLV bites the dust. If this was a vehicle driven by the general public, all of them would have been recalled years ago. But not the Post Office! No! They have their own set of rules. Was a fire extinguisher available in the vehicle?